Hello, fall ! Good to see you again! In a previous post I was telling you how much I love fall and among all the things I love about it there is one in particular: if it’s fall for me it’s open season to baking. In my opinion there’s nothing more pleasant then a kitchen full of a freshly baked dessert aroma. 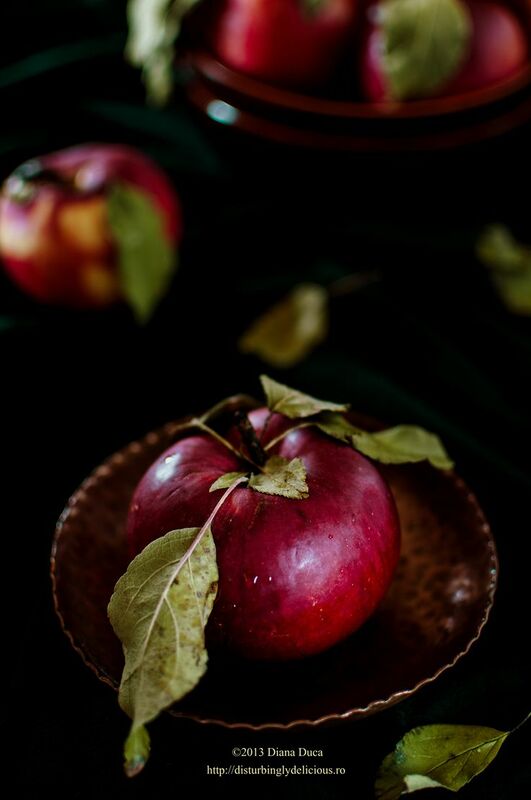 And through all the goodies fall brings, apples are the most common and easy to find and use for delicious desserts: from strudel and crumble to crêpes, cakes, tarts and pies – all full of flavor and delightful. Today I’m gonna start the baking season with a classic apple pie, which is the best comfort dessert ever for an autumn day. Dice the butter (it has to be very cold) in small cubes (1cm). Sprinkle the butter cubes over the flour mix and work them with two knives or a pastry blender until the mixture resembles coarse meal with small butter lumps (the butter pieces are the size of tiny peas). Drizzle the ice water one spoon at a time and stir gently with a spoon just until the dough comes together (squeeze a small handful and if it doesn’t hold together, add more ice water; do not overwork the dough, or pastry will be tough). Divide the dough in half , flatten and form two disks. Chill dough wrapped in plastic wrap for at least one hour . Soak the raisins in amaretto to plump. 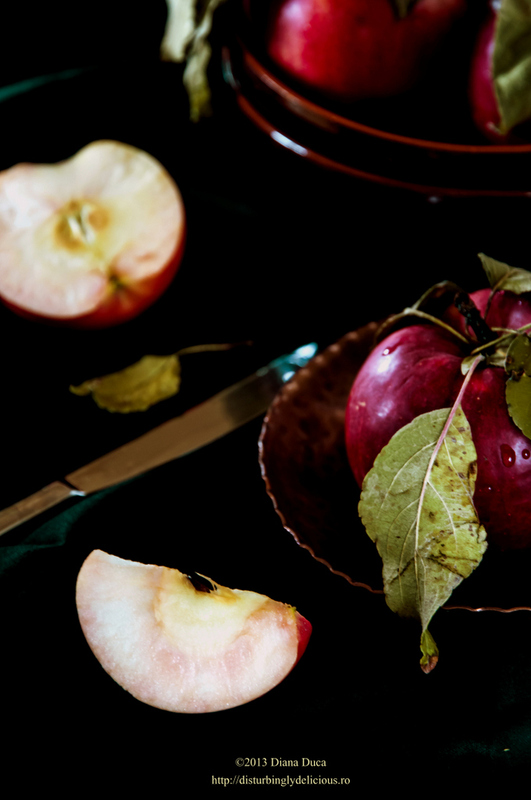 Peel, core and cut the apples in small cubes, toss with lemon juice to stop them from turning brown. Sauté in butter for few minutes. Add raisins, sugar, nutmeg, cinnamon and flour and set aside. Heat oven to 220°. Remove dough from refrigerator. Whisk together egg yolk and milk and set aside. Roll out a piece of dough on lightly floured surface and transfer it to the pie tin. Make sure the top crust is rolled big enough to cover the filling. 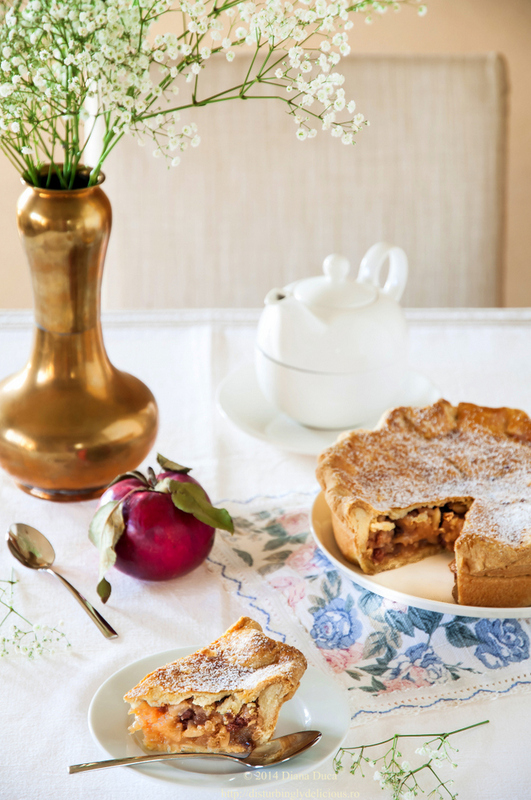 Place apple mixture evenly over the bottom crust. Roll out the second piece of dough; brush the rim of the bottom crust with the egg wash and place over the second pie of dough on top and trim so 2,5cm overhangs. Fold the dough under itself and crimp crust edge with a fork or fingers. 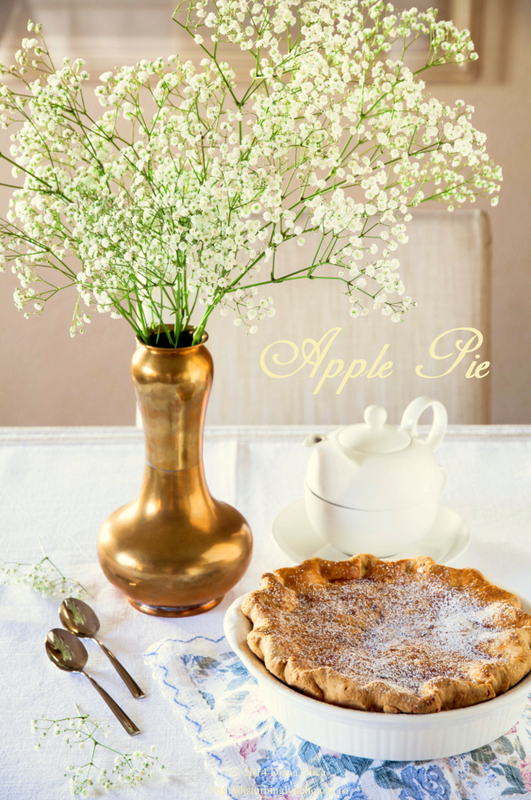 Brush the pie with the egg wash, sprinkle with sugar. Make four slits on the top of the pie allowing the steam to escape. Bake in the preheated oven at 220° until crust begins to turn light brown for 10′. Turn the oven down to 185 °C and bake for another 30-35′ until the crust becomes golden brown and juices are bubbling. Serve it with cream or vanilla ice cream if desired. O cutiuta dulce din care as trage si eu un sertaras pentru ca sa il mananc cu mare pofta. Pozele cu merele sunt de vis. Ce culoare si stropii de apa ce frumos se vad.